When you're slathering on your sunscreen this summer, don't forget to protect your ringlets. Unlike skin, hair will not become red and painful when it is overexposed to the sun so it's more difficult to measure UV damage in hair. But UV exposure can sap the hair of strength and elasticity and cause photooxidation, which triggers discoloration and fading in both natural and color-treated hair. According to a study by the René Furterer Research Center, after just three days of sun exposure, the scale-like cells that cover each individual hair shaft begin to pull off, making the hair dry, dull, and brittle. And while a hat is always an option for protecting our curls, we all know that hats and curls don't always get along well, and sometimes we just want to rock our locks, right? "Hair does not get sunburned," says Stephanie Sprankle, manager of education and development for Redken. "But it will fade. If you put a couch in front of a window, the side against the window becomes really faded. It's the same with the hair. You don't want to spend all that money coloring your hair and have it wash away." A growing awareness of the sun's damaging rays along with technological advances in the hair-care industry have led to a boom in the number of summer hair products — products with names like Coola, Sun Shield, Swim Cap, Sun Veil, and Canopy. These products are designed to protect the hair during summertime activities like swimming and sunning, as they moisturize and repair parched locks. In addition to products specifically designed for use in summer conditions, many companies have added UV protection to their products. Color-treated hair, especially, has been treated to a robust selection of UV-protectant products: Paul Mitchell Color Protect Locking Spray, Aveda Color Conserve Sun Protector, Cantu Anti-Fade Color Protecting Oil, and Pureology UV Colour Defense, for example. Always protect hair when in the sun. Use a UV protection product, a hat or scarf. Reapply UV protection throughout the day. Use a deep conditioner once a week. Wet hair before going into a pool. Rinse hair well after swimming. Limit shampooing to once or twice a week. Unlike skin products, hair products typically are not rated on their sun protection factor (SPF). But the UV filters in hair products protect against the same things as skin products — UVA and UVB rays, says Jennifer Volpi, senior manager of marketing for Biolage. Rene Furterer has created a KPF (keratin protection factor) protection measurement rating for its Sun products, the first hair protection rating system. The L'Anza Swim & Sun line uses the HPF (hair protection factor) measurement system for its products. Hair can be best protected from UV damage by treating it with a leave-in product that contains UV filters such as ethylhexyl methoxycinnamate, methoxydibenz-oylmethane, or Parsol SLX. "I love to spend time in the sun, but I see firsthand the damaging effects of the sun on hair," says stylist Frederic Fekkai. "That's why I expanded my summer hair collection to help keep hair looking healthy and luxurious all summer long." Fekkai's summer hair line includes sun-safe formulas designed to protect, hydrate, and replenish the hair. They contain ingredients such as Solarshield technology, humectants, sunflower seed extract, and moringa seed extract to condition and protect the hair from UV damage, pollutants and environmental stressors. Davines Su Suncare System for Hair consists of products that protect hair from sun, sea water and chlorine. Philip Kingsley has developed Swim Cap, a leave-in conditioner with UV protection to protect against the sun as well as ingredients to repair damage caused by chlorine, saltwater, and wind. The Phytoplage line by Phyto includes protective treatments with UV filters and moisturizing and repair treatments for after-sun care. And Kerastase offers its Soleil UV Defense Active line of products designed to protect, repair and enhance sun-exposed hair. 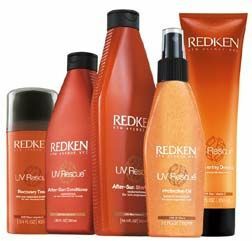 Redken's UV Rescue line — After Sun Shampoo and Conditioner, Shimmering Defense Daily Care Protective Lotion, Protective Oil and Sun Milk — is designed for sun-exposed hair and scalp. The products contain an exclusive Interbond Conditioning System and C2Solar Complex to help combat UV damage, dryness and discoloration, with special ingredients to reconstruct the hair's internal structure and soothe and replenish the hair and scalp. "The line offers more than just UV protection," Sprankle says. "It's used to help fight against environmental issues that could damage the hair." Fairy Tales' Lemon-Aid Conditioner removes chlorine green from kids' hair (Also check out their Coco Cabana Leave-in Sun Spray). And many sun lines include shampoos that remove chlorine and salt from the hair without stripping color. But don't shampoo too often, says Veronique Morrison, director of education for Mizani. And when you do shampoo, make sure the shampoo isn't too alkaline. Consider Mizani's PuripHying Shampoo and BotaniFying Conditioning Shampoo, which remove chlorine, salt and sweat without stripping the hair of its natural moisture. Moisture is key during the summer, says Morrison. She recommends putting on a product like Mizani Moisturefuse Moisturizing Conditioner and leaving it on while you're out in the sun. It moisturizes while protecting the hair from the elements. Deep conditioning is a must during the summer, especially if you are often outdoor. "The harshest part of summer is the lack of moisture," Morrison says. How do you protect your hair from the summer sun? Tell us in the comments section below. And If you're looking for a natural sunscreen, read up on rice bran oil.